Our first trip of 2014 took us to Warsaw for the International Friendly between Poland and Scotland. We selected Fundacja Dziecieca Fantazia – The Childrens Fantasy Foundation – to be the recipient of our 50th consecutive donation. 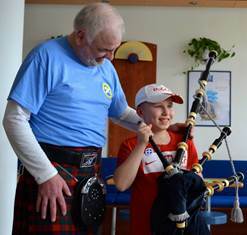 Fundacja Dziecieca Fantazia aim to grant the wishes of terminally ill Children all over Poland, no matter how big or small. They have been running for 10 years, in which time they have granted wishes for over 3,000 children. We pledged our donation of £2,000 to help assist the charity in attempting to grant further wishes to children waiting, and at any one time, the charity can have over 1,000 requests. On matchday, we met the children along with their parents and management team from the charity at a nearby hotel. We were introduced to Paulinha from FDF who had organised the event on the charities side, and “the big boss” as she was introduced to us, Patrycja. Chairman Daly welcomed everyone, giving a short history of the Sunshine Appeal from its origins to the present. Patrcyja (translated by Paulinha) gave a similar background of FDF, and introduced us to each of the children, thanking us for choosing them as a recipient charity. 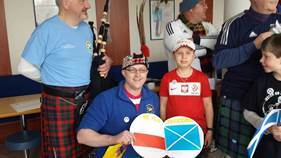 The children had made small gifts for us, a card with some polish translations, a football Scotland v Poland card with polish footballing terms, a small model house of a standard polish home, and a handcrafted wooden polish/Scotland flag, which were very graciously received. 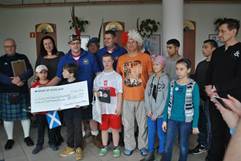 We presented the cheque for £2,000 handed out some badges and chatted further with the parents and staff. The really heart-breaking bit about it all for me, was discussing our future visit later this year for the Euro 2016 qualifiers – and being told it is unlikely the 5 children we met would still be around when we returned to Warsaw in October. Being able to contribute to such a big part of the 5 children’s wishes makes what we do so worthwhile, and that is only possible with the fantastic support we receive.